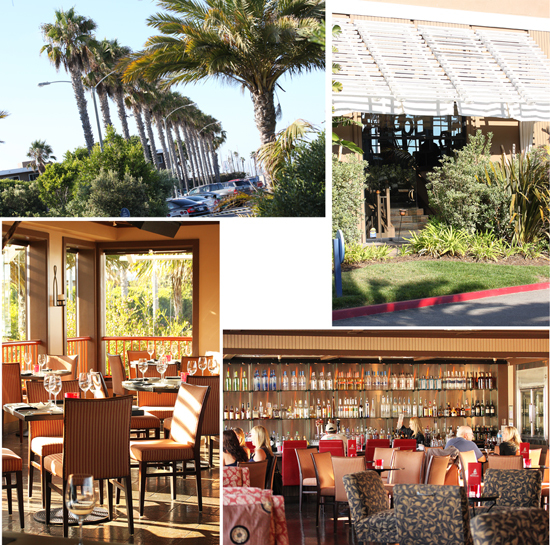 Recently I had the great good fortune to be invited to review BALEEN, the signature restaurant at The Portofino Hotel & Yacht Club in Redondo Beach. 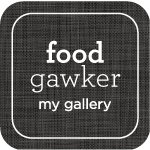 And I want you to know, before you read the rest of this post, that the food at this restaurant is absolutely amazing and beautiful, and this is now my most favorite restaurant in the South Bay. You must go eat there. 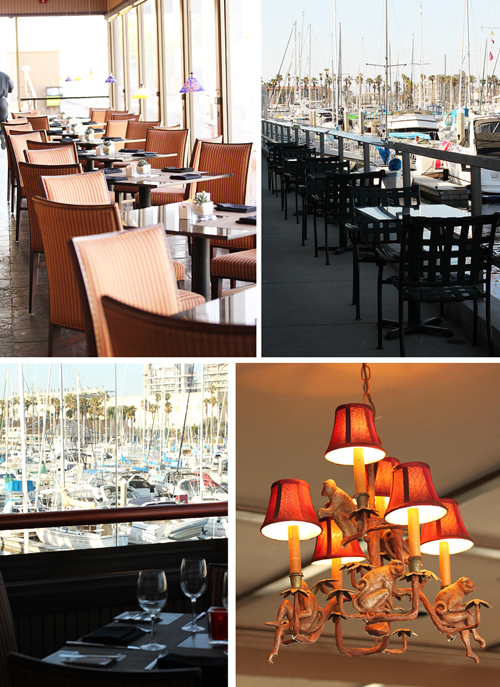 The restaurant is housed in its own separate two-story building across from the hotel and adjacent to the marina. The inside has a tropical feeling with shiny wood floors and walls, and a bit of whimsy as monkeys cling playfully to the chandeliers. On the water side there is a full length, massive wall of windows through which you can see the grand vista of hundreds of boats in the Portofino Marina. Upstairs is the dining room and lounge, and down stairs is the terrace, part of which is inside across from the kitchen area, and part is outside enclosed in a long curtained alcove. I arrived a half hour early so I could walk around and take photos before I was scheduled to meet the chef. The Hotel is located on a private peninsula and you drive into a circular driveway, with the Hotel on the ocean side and BALEEN on the right hand harbor side. They have free valet parking, so my car was whisked away. I was a little nervous because it was late afternoon, the sun was going and I wanted to be able to take really fabulous photos of the food. I had not seen a menu, so I had no idea what the food was going to be like. Executive Chef Jesse Souza has been at BALEEN for seven months, after two years as executive chef at La Playa in Naples, Florida, where he ran 4 kitchens with 4 chefs, a private club and a beach kitchen. He told me all he did was solve problems. Finally he said to himself, “I want to cook. I want to make a menu!” and that’s why he came here. 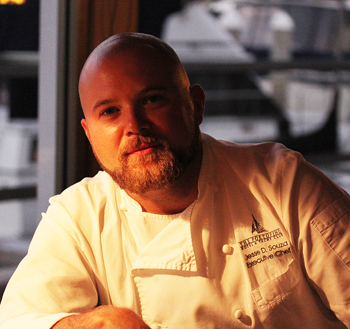 Chef Jesse started as a dishwasher out of high school at the Asticou Inn in Northeast Harbor, Maine. He worked his way up in the pantry, doing prep work, then as sous chef. At the Clarement Hotel he was executive sous chef for 2 years. He worked with Robbin Haas and Adam Votaw, and opened Chispa where he was chef d’cuisine and executive chef. 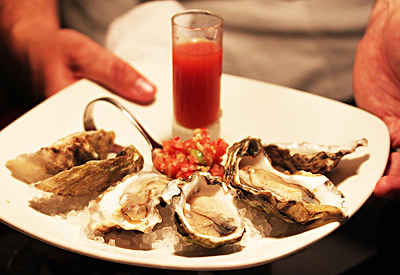 At Chispa the food was Nuevo Latino and he learned the dishes of South America, Spain and the Carribbean. So now we can all benefit from his extensive and varied experience. I set up my photo area on a little table across from the kitchen. You can see them in the photo above with the little colorful lights hanging down. They weren’t seating anyone there, so it was a perfect place. I had no idea what the dishes were going to be, so when Chef Jesse brought out the first plate, I had to gasp. 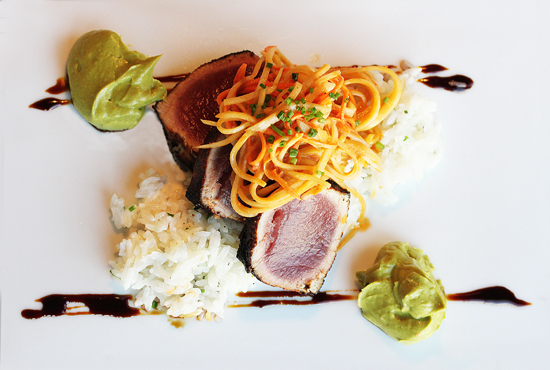 The Cane Sugar Seared Ahi Tuna with Coconut Rice, Spicy Papaya Salad and Avocado Wasabi Sauce was like a beautiful painting. The best way to photograph this masterpiece was from straight overhead, so I stood on a chair to get the shot. There were customers walking by and rubbernecking. I ignored them. 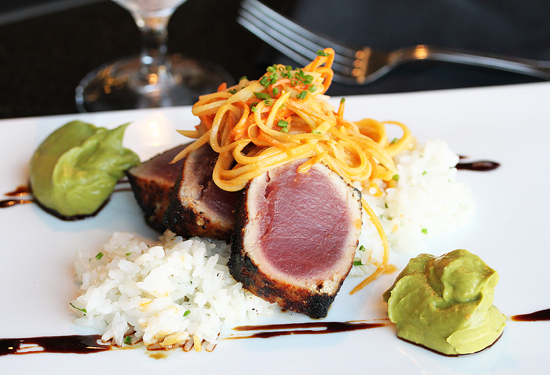 I couldn’t decide which of these two photos of the Ahi Tuna to put in this post, so I am putting them both in. I showed Chef Jesse the shots of the Ahi Tuna and he was very happy about them. So he started bringing out more dishes for me to photograph. 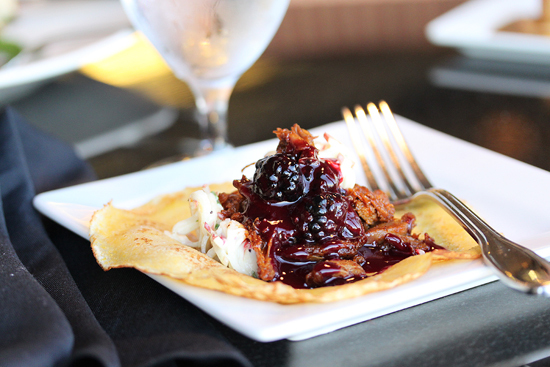 Next was the Duck Carnitas & Cornmeal Crepes with Chipotle Blackberry Sauce and Appleslaw. The long rectangular plates were hard to shoot and get everything in. Also if I got the duck with the right light, then the appleslaw was overexposed. If the appleslaw was correctly lit, the duck looked like a black blob. 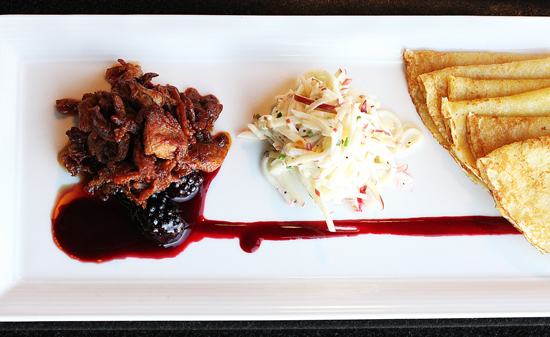 Finally, Chef Jesse suggested we plate a duck carnita and see what that looked like. He had fun drizzling the sauce while I took multiple shots, catching the sauce in mid air. There were so many good photos from this that I couldn’t put them all in. So I picked the one that looked the most gorgeous and mouth watering. 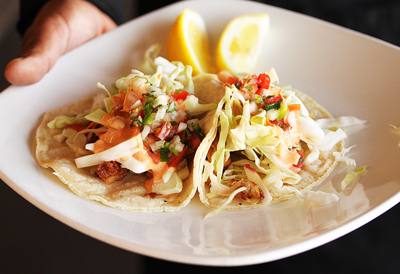 When you come to eat at BALEEN, you absolutely must order this dish. The Chipotle Blackberry Sauce is sooo good. My mouth is watering just thinking about it. The Portofino Hotel is owned by Seattle-based Noble House Hotels and Resorts. They own and manage 13 unique boutique hotels and resorts located across the country including Riviera Palm Springs in California, Little Palm Island Resort in the Florida Keys, and The Edgewater in Seattle, Washington. So there is a BALEEN in Naples, Florida, and one in San Diego. Chef Jesse said the menu is made up of Corporate dishes served in all of the NHHR restaurants and then there are his signature dishes served only at this BALEEN. And these works of art he was presenting to me are those very signature dishes. I asked if any restaurant reviewers had visited and he said he thought two had been there, but he didn’t know they were coming and they didn’t order any of his signature dishes. So he was very happy I was photographing them now. I was very excited to get this post up so all of you could see them, too. The next dish to come out of the kitchen was Roasted Sea Scallops & Braised Beef Short Rib with Vanilla Parsnip Puree, Glazed Carrots & Mustard Pan Sauce. The plates were now totally covering the small table where I was working. This beautiful plating was set before me and I just had to shake my head. I didn’t want to mess up the way it looked before shooting it, so I stuck my finger in the sauce where it wouldn’t show. I just had to sit there, shut my eyes and go Mmmm. This was another of those long rectangular plates that I stood on my chair to shoot. This photo doesn’t do justice to the way it looked in person. But imagine a bite of the sweet parsnip puree with the beef and sauce all mingling in happiness on your tongue. Heaven. We had been photographing about 2 hours at this point and I asked Chef Jesse if we were through yet. 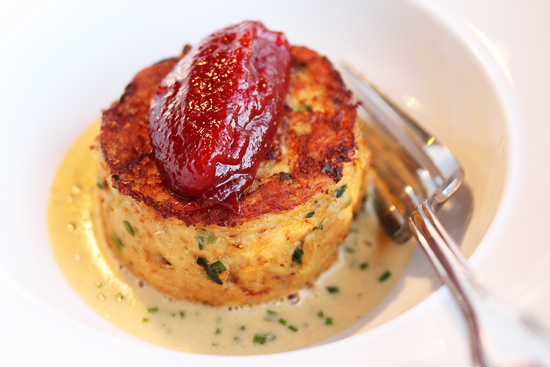 His eyes lit up and he went back in the kitchen, reappearing minutes later with this Dungeness Crab Cake with Shrimp Mousse, Lobster Lemongrass Sauce and House Made Tomato Jam. He said he’d made the crab cake a little bigger than they normally do so it would photograph better. He liked the way the snipped chives showed up. I was done shooting all the plates on the table and Chef Jesse said there was one last dish. 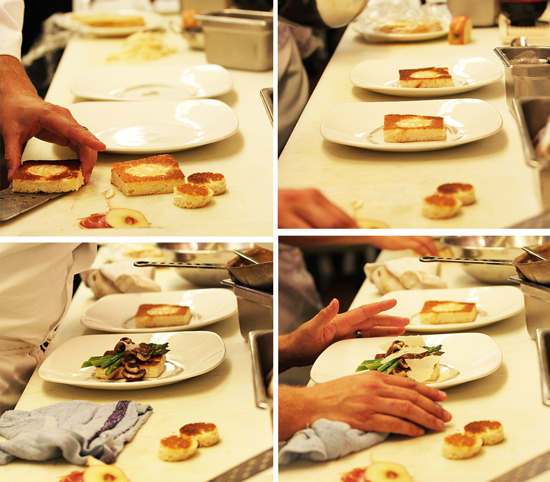 So I followed him into the kitchen and watched as he plated the Warm Asparagus & Mushroom Salad with Brioche “Hole In One”, Reggiano & Truffle Vinaigrette. I love to watch a chef plate a dish, with all the care of an artist. This was my favorite dish of the whole night. Hands down. That creamy truffle vinaigrette is the most…I’m at a loss for words. My first bite stopped me in my tracks. I had to shut my eyes and just savor it. Chef Jesse came over and saw my rapture, picked up my knife and sliced open the egg. The brilliant yellow yolk ran out onto the plate and we both just stood there looking at its perfection. 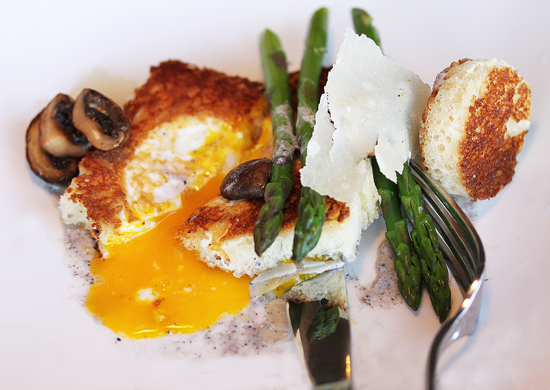 He said there was something about the synergy of the yolk and truffle sauce that was so splendid. I had to have this recipe. And Chef Jesse happily gave it to me. It’s at the end of this post. It was time to pack up my camera, but I shot these two dishes as the servers walked by my table from the kitchen. The prices at BALEEN for breakfast items are from $7 to $14 and lunch from $7 to $17. Dinner entrée prices range from $13 to $36. The entrees also come in half portions. 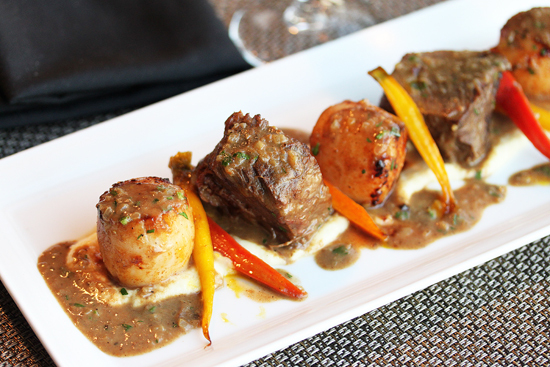 For instance, the Roasted Sea Scallops & Braised Beef Short Rib for half $16 / full $28. And the Duck Carnitas and Asparagus, Mushroom, Brioche “Hole In One” are both only $13. Don’t forget that there is free valet parking also. Thank you Chef Jesse Souza for one of the most memorable experiences and for letting me photograph all of your beautiful food. Thank you for taking your valuable time to prepare each dish and your patience as I took hundreds of photographs. And for ignoring the fact that I was standing on one of your chairs (I did take off my shoes). I enjoyed our conversation very much and the tips you gave me about truffle oil. I will be bringing all my friends to eat at BALEEN and I will be telling everyone I know to come and visit. Soon. 2. With a 2-inch biscuit cutter, cut a disk out of the center of each 4-inch bread square. Reserve cutout bread disk. 3. In a large saute pan, melt 1 tablespoon of butter and add mushrooms. Cook until browned. There will be a small amount of reduced liquid remaining. Add the asparagus and broth and cook until a glaze is formed and the asparagus is crisp tender. Season to taste. 3. In a large flat pan or griddle, melt the butter and olive oil together. When sizzling, add four slices of brioche and the cutout discs. When starting to brown, break egg into each hole. Cook until bread is a deep golden brown and egg is cooked on that side. Cook the bread discs until brown on both sides. 4. Using 2 spatulas, slide one under toast and pick up. Place other spatula on top of toast and flip over. Place spatula with toast touching pan, and with free spatula, slide toast back into pan. Cook until toast is browned and egg is cooked, but yolk is still runny. 5. Drizzle about ¼ cup of Truffle vinaigrette in a 5-inch circle around each plate. Place the toasted square in the center of plate. 6. Re-warm the asparagus and mushroom mixture slightly. Using a tongs, place ¼ of asparagus diagonally across the toast square. 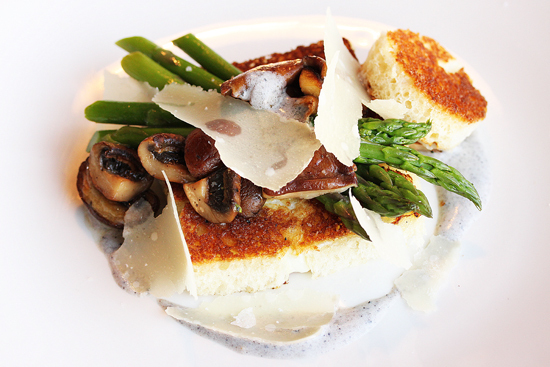 Place ¼ of mushrooms on top of asparagus. Drizzle about 1 tablespoon of Truffle Vinaigrette over center of mushrooms. Lean the bread disc against the side of the toast. 7. Place 6 shards of Parmigiano reggiano around on each salad. Serve. 1. Place all ingredients, except sour cream, in blender. 2. Puree until truffle peel looks like ground black pepper. 3. Fold puree into sour cream. Check seasoning. Wow. You have me sold. Each of these plates look like a piece of art! I don’t know if I’ve ever been served something so visually appealing. I almost wouldn’t want to take a bite…but that would be a huge mistake, as everything sounded delicious! I am putting this on my to-do list…one day I’ll eat at a place as wonderful as this! Gah! You know I’m a HUGE fan of Baleen!!! I’m definitely checking them out during restaurant week…..if not before! No words. I’m drooling over here! This place looks superb and I’m super jealous I don’t live anywhere near CA. Oh MY !!!! You make me want to cage my kids, find a babysiter and fly across the country for dinner at Baleen. I may have to wait till my kids grow up but need to make LA weekend or week with hubby and call you for all the restaurant suggestions. Lynne, I am astounded at all you’ve accomplished with this post. The details and care that went into everything—it is of such high caliber. You really are a pro! Congrats! Fancy-shmancy! 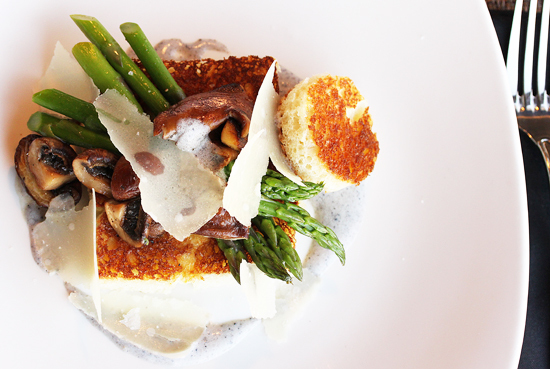 It all looks incredibe–love the idea of truffle vinaigrette! Oh my goodness!!! 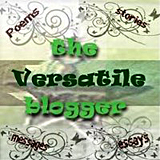 Beautiful photos, descriptive prose… you’ve got the whole package!! The dishes not only look stunning but the descriptions… I think I’d need to starve myself for a week so that I could order everything you photographed!! I am SO thankful you were able to post the salad recipe – I am definitely going to be trying this one – have some big dinner parties coming up and this would be perfect!!! Baleen is def on my list of restaurants to try!! I haven’t tried Baleen either. I drive by all the time and think “We should go there sometime” and always end up going to our regular spots. Now I know that we must go there! Oh wow! Your photos are so gorgeous! Lovely work–ahi tuna, roasted sea scallops..eeek! I’m drooling! Lynne, chef Jesse Souza is an artist, and SO ARE YOU! Visually stunning, from beginning to end. Stunning photographs! Love them all! Baleen is so far away if not, I will go there right now!